Tropical Depression Crising was estimated at 260 km Northwest of Zamboanga City and anew LPA was estimated at 220 km Northwest of Puerto Princesa City, according to report by PAGASA. PAGASA weather bulletin as of 4:00 a.m, "the center of Tropical Depression "CRISING" was estimated based on all available data at 140 km Northwest of Zamboanga City (7.5°N, 120.8°E) with maximum sustained winds of 45 kph near the center. 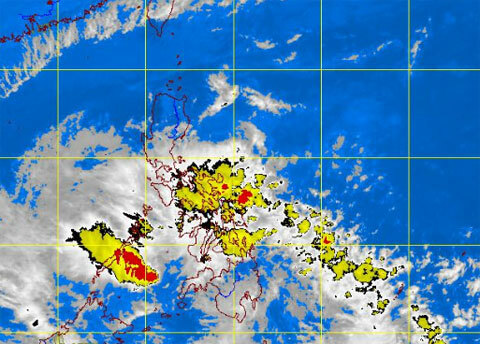 It is forecast to move West Northwest at 24 kph." PAGASA Heavy rainfall warning Yellow are up to the following areas; Surigao, Davao, Caraga, Compostela Valley, Misamis Oriental and Occidental, Bukidnon, Lanao Del Norte, Lanao Del Sur and Cotabato. PAGASA storm warning signal elsewhere is now lowered, while signal number 1 (45-60 kph winds) are up to the Southern Palawan and Zamboanga del Norte area. Meanwhile, PAGASA advised fishing boats and other small seacrafts not to venture out into the Northern, Eastern and Southern seaboards of Luzon, the Central and Eastern seaboards of Visayas and Eastern seaboard of Mindanao. Comments or suggestions about "Tropical Depression Crising Update" is important to us, you may share it by using the comment box below.